Students use addition sentences to show sums of numbers in this fun online math test. They must also be able to recognize the addition sentence shown in the form of colorful pictures. This test has ten problems: seven multiple choice and three drag-and-drop problems. Students must recognize number sentences with sums up to 10. 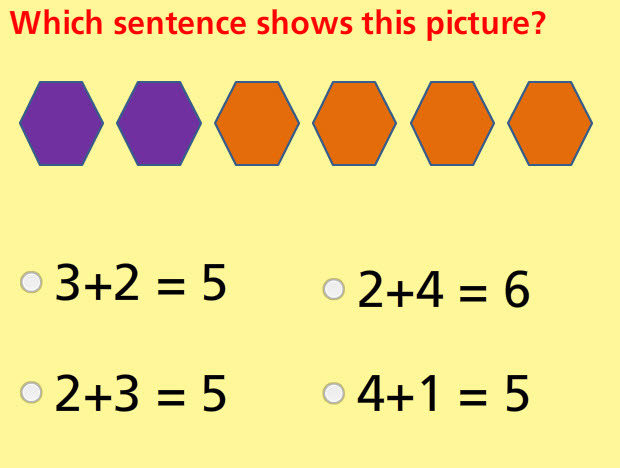 Students can use these pictures and get stronger in adding numbers. As it becomes more clear about the connection between number sentences and the pictures, the test results should reflect the student growth. Return from this Addition Sentences Sums up to 10 Math Test to the Elementary Math Tests , 1st Grade Math Tests webpage, or to Math Tests.